Succumbing to the lure of homemade hot cocoa with chocolate dipped spoons is not just a good idea, it a fabulous idea! Imagine the look on your husband or boyfriend's face when you cozy up beside him on the couch and present him with a delicious cup of homemade hot cocoa. And then to top it all off you have a chocolate dipped spoon on the side to stir the chocolate indulgence, and complete the treat. This is a gift of delicious, decadent goodness. There is no end of ways that you can express your friendship and love with a gift of chocolate covered spoons. It is a perfect holiday gift to give co-workers, your child's teachers or your neighbors. It can be given as a sweet Valentines gesture, as a cute thank you present or a get well gift. It can also be great as a party favor, a treat for a girlie sleepover, or as an unexpected present to an old friend on the occasion of just announcing they are pregnant or have got engaged. Or just because it’s a Tuesday! You don’t need an excuse to pamper someone. Just do it! 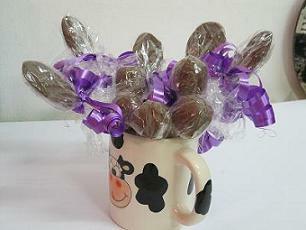 Spoil him with chocolate covered spoons to really upgrade his homemade hot cocoa mug... Yummy! Chocolate covered spoons are the best hot cocoa gift, aren't they? Melt some chocolate the microwave – Break your favorite chocolate up into pieces so that it melts more easily and put it in a microwave safe bowl. Run the microwave for 30 seconds, stir it and rotate the bowl if necessary. Now, run the microwave in 15 second increments and stir it in between. Finish heating when most, but not all, of the chocolate is melted. Stir it until it is smooth, glossy, and completely melted. 300 grams (10.5 Oz.) of chocolate will make about 12 spoons. 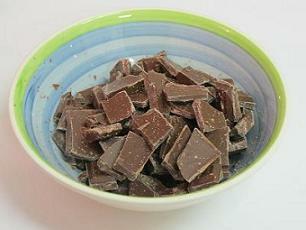 Chocolate doesn't like water so make sure the bowl, spoons… Everything is completely dry. 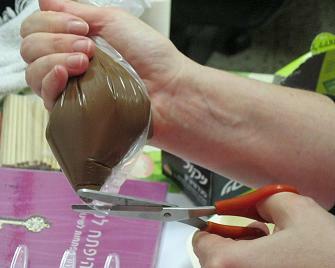 Pour the melted chocolate into a strong, sealed, clear plastic bag - Make sure that you use quite a strong bag for this process, because your will be exerting quite a lot of pressure on the bag, and you don’t want it exploding everywhere and covering yourself, the walls, and the dog with chocolate! (He should be so lucky!). Tip – Put the bag first into a cup and then just spoon it in until the bag is full. Take the bag out of the cup and make a small cut at the end - it becomes like the same kind of thing you would use for icing a cake. Not too big though or you won’t have proper control over the stream, and not too small so that you can’t squeeze any chocolate out! Lay out your 12 plastic spoons (metal will work as well) and “ice’ the chocolate into the center of the spoons - Level them off so they look very prim, proper and smooth as silk. 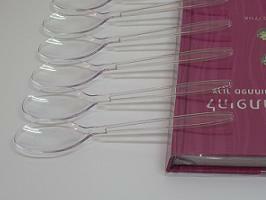 Tip – Use a book to lean and level the spoons. 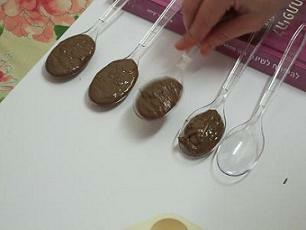 After filling all spoons hit them gently on hard surface for proper and smooth look. Leave the chocolate to harden in a cold room. 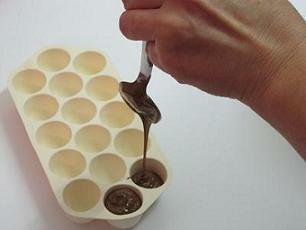 Gradual works best for this so that the chocolate can adapt to the temperature. Don't put them in the refrigerator. The wide changes in the temperature might cause white spots to appear on the spoons (this is not harmful to eat). You can garnish them with any other toppings. You can put in marshmallows and M&Ms if the fancy takes you! 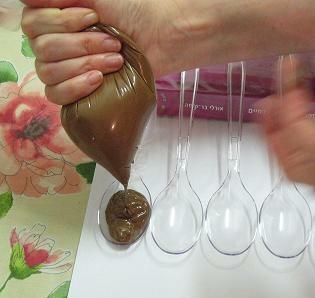 Fill the molds with the chocolate using a spoon or a plastic bag (like you did with the spoons). 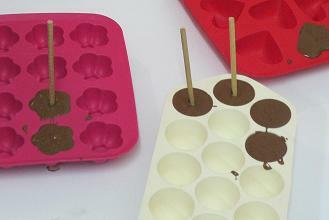 When the chocolate hardens a bit put wooden lollipop sticks in each mold –Push the stick until the middle of the mold. 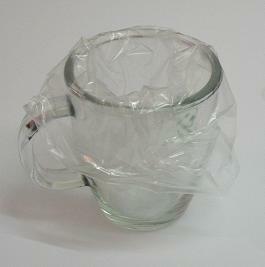 When completely harden take it out of the mold and wrap it with cellophane bag with a colorful ribbon. Now all that's left for your recipient to do is to prepare a hot cup of homemade hot cocoa, dip the chocolate covered spoons and… Enjoy!! !